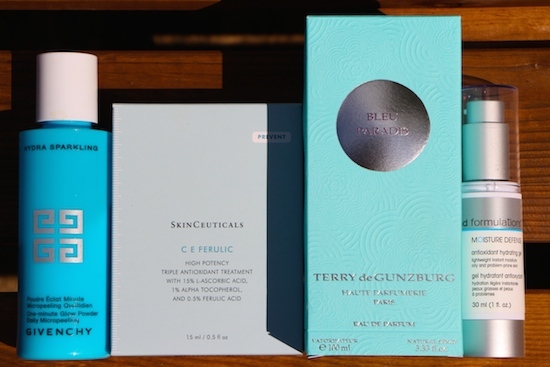 Some lovely, summery skincare bits and pieces that I’ve been trying. I’ve probably harped on about the MD Formulations Moisture Defense (right of photo) quite enough by now, but just to recap: weightless skin hydration with a load of antioxidants packed in. 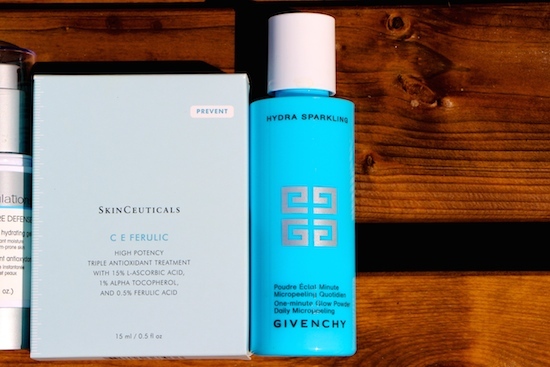 Perfect for popping on beneath your sunscreen – it has been formulated for oily skin, so bear that in mind! The only absolute pain-in-the-arse about this is that MD Formulations seem to have ceased trading in Europe. I’m very upset about this, they are a great brand and their Antioxidant Spray is one of the only “toners” that I use regularly. I’ll try and find out a bit more, but in the meantime I have found the Antioxidant Gel as part of a travel kit here. 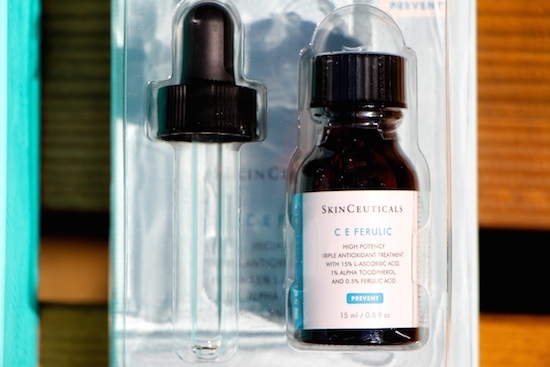 If you want the antioxidant boost for daytime but want something you can use on all skin types, before you moisture, then one of the undisputed best is SkinCeuticals CE Ferulic. It’s pricey, (bit cheaper on Amazon here) but you need just a few drops at a time and if you’re looking to really supercharge your daylight protection then this is an excellent choice. Gentle, low-abrasion exfoliation from Givenchy with their Hydra Sparkling One-Minute Glow Powder. You will perhaps be familiar with these powder exfoliants; they look like flour when you tip them out and seem to have no real grit or texture to them, but when you massage them over the skin they very gently slough away dead skin cells. Givenchy’s version is lovely and does have a slight grittiness – it’s £29.50 here – but if you’re on a tighter budget, Indeed Labs have one at Boots.com that’s very good. Very good – wait for it – Indeed. You may have spotted the perfume in the first picture and wondered, what does the scent have to do with sparkling summer skincare treats? Absolutely nothing is the answer, it was just blue and I needed another blue thing to make it all look nice. 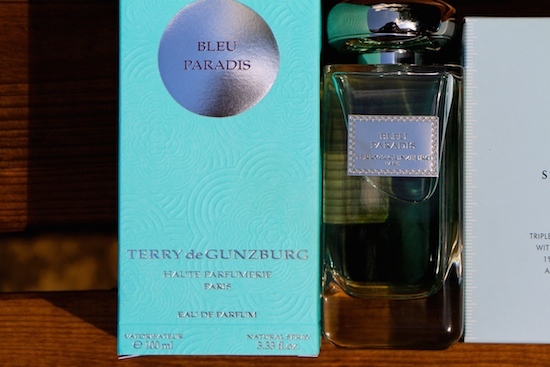 But this is a gorgeous fragrance for summer; Bleu Paradis is fresh and cool but has a musky, woody undertone that makes it almost masculine. It’s perfect evening-after-the-beach stuff, this. At £105 it’s a whopper of an investment, but that’s for 100ml – compare it, price per ml, to most luxury perfumes and it’s about the same. It’s actually far less, price-per-ml, than Coco Mademoiselle* and less than half the price of Tom Ford’s Santal Blush. Who knew? Well done Terry du Gunzberg, maker of my favourite foundation which also happens to be (unfortunately) the most expensive foundation in the universe. Almost. *based on price of 50ml Parfum at Debenhams, £68. Previous Post How to Start Running – Tips from the Top!